1/2 cup green onions, minced. green part only. 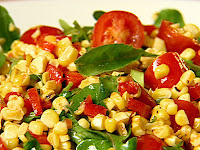 In a large bowl, combine black beans, corn, peppers, onion and cilantro. In a small bowl, whisk together vinaigrette ingredients. Drizzle vinaigrette over bean mixture and toss to coat. Serve chilled or at room temperature. Yields about 1 cup per serving.